What a remarkable book this is; short on pagination but heavy on fact, it is, quite rightly, a classic in the field of reportage and she is one of the genre’s greatest exponents. 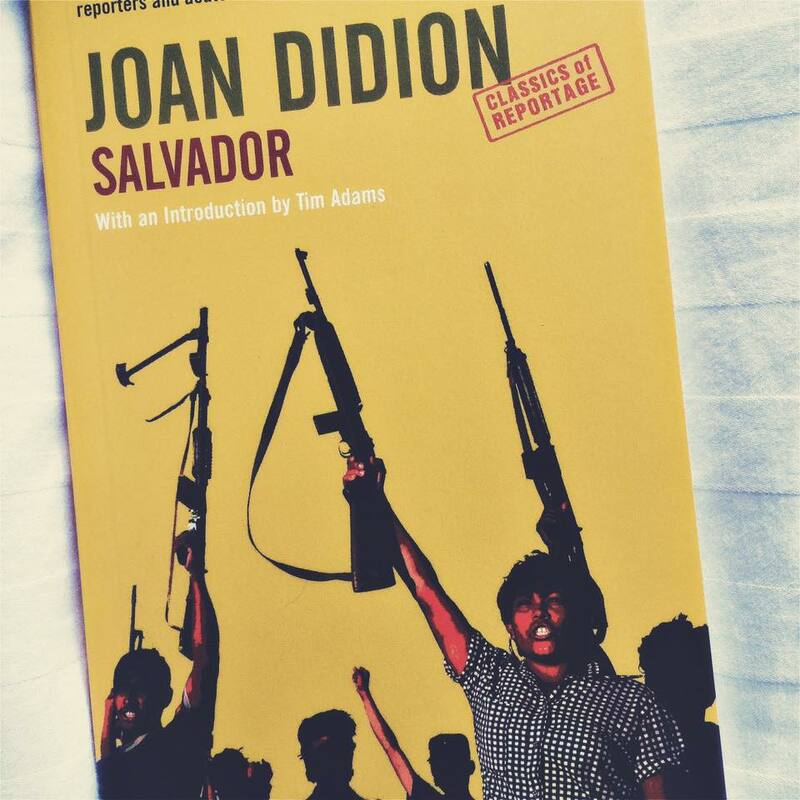 Joan Didion takes us into El Salvador in 1982, the civil war is at its height and she is there for two weeks to see the country and what it has become under a puppet government plundered and picked over by an American administration. Didion prepares both the potential visitor and the reader to the grim realities of El Salvador in those times; ”There is a special kind of practical information that the visitor to El Salvador acquires immediately, the way visitors to other places acquire information about the currency rates, the hours for the museums. In El Salvador one learns that vultures go first for the soft tissue, for the eyes, the exposed genitalia, the open mouth. One learns that an open mouth can be used to make a specific point, can be stuffed with something emblematic … if the point has to do with land titles, stuffed with some of the dirt in question. One learns that hair deteriorates less rapidly than flesh, and that a skull surrounded by a perfect corona of hair is a not uncommon sight in the body dumps.” It happened and it happened in huge numbers, as in so many conflicts it is the loss of the innocent which haunts the reader and El Salvador will be forever scarred by the actions of the few on the many. Combine this with her notes on an attempt to buy water purification tablets at the local shopping mall in which she became fascinated by the music playing and the bottles of vodka and tins of foie gras pâté on sale whilst guards checked the shoppers for weapons. It gives the sense of normality vying for a place amongst the madness, a brief respite from what goes on outside of the mall until she leaves and reality resumes; “As I waited to cross back over the Boulevard de los Heroes to the Camino Real I noticed soldiers herding a young civilian into a van, their guns at the boy’s back, and I walked straight ahead, not wanting to see anything at all” Didion, like the reader cannot help but stop and reflect upon this sense of ‘normality’, should such items be on sale in such a setting? How does it counter against the terrors being committed within a short distance from those shelves? There is strong argument for saying that it should absolutely do that, to remain defiant despite the carnage but it would be disingenuous to pretend it didn’t matter or cause moment for reflection. The Salvadorian Civil War lasted for twelve years, its stories are many and tragic. Civilians were deliberately targeted by death squads, child soldiers enlisted to the cause, untold numbers of human rights abuses and thousands upon thousands of deaths and ‘disappearances’. Granta Books republished this classic study as part of their Reportage series. It is a must read, I felt compelled to read it if, for nothing else, as a tiny way of paying respect to those murdered in the name of politics. Kudos to Didion and Granta for their role in reminding all of us of a story which should never be forgotten.